Exclusive Bing Crosby releases on DVD-R format. Some of the content is in the public domain, but each disc is © by Festival Films. Produced and directed by Bob DeFlores and Ron Hall. 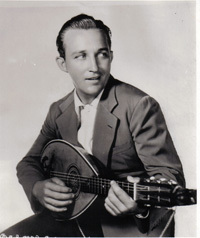 Archival footage from Bob's extensive collection tells the fascinating true story of Bing Crosby's rise to fame from 1925 to 1933, his years with the Rhythm Boys and Paul Whiteman, singing at the Cocoanut Grove, starring roles with Mack Sennett, his first radio show, the Paramount Theatre triumph and stardom in "The Big Broadcast." See Bing in "Two Plus Fours," "Reaching for the Moon," "Check and Double Check," "Hollywood on Parade," "Confessions of a Co-Ed" and more! Hear rare interviews with Bing and Al Rinker about the early years. Bing sings with Perry Como on a 1960 TV Show. Edward R. Murrow visits Bing Crosby in his home in 1954. Wayne and Shuster host an hour documentary on the careers of Bing Crosby and Bob Hope, both separately and as a team. "The Shining Future" -- 1944 Canadian war bond short with Bing, Frank Sinatra, Deanna Durbin, Charlie Ruggles and more. An excerpt with Bing and Bob from a 1958 "Bob Hope Show" fund raiser for Boy's Town of the West. 1964 ABC promo for Bing's situation comedy. And finally, a rare Russ Columbo short is the surprise! Theatrical Trailers to: "Sing You Sinners" (1938), "Birth of the Blues" (1941) & "Here Come the Waves" (1944). "Meet The Crosbys" (1945) Bing plays baseball with his four sons, then sells war bonds. "Coast Guard Short" Bing sings "Ac-cent-tchu-ate the Positive" and "Don't Fence Me In" with the Bouncing Ball. Out-takes from the "Bing Crosby Show" (1964-65) with Beverly Garland and Frank McHugh. "The One and Only Bing" -- "Hollywood and the Stars" tribute broadcast 12/23/63. "The GE Show" (1954) Bing's first TV show with guests Jack Benny and Sheree North. 88 min. Bing Crosby and Bob Hope donated their talents to many patriotic and inspirational films, to boost morale during World War-II and to champion American ideals in peacetime. These rare shorts continue to entertain and inspire today. 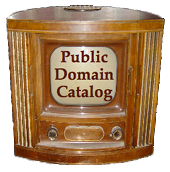 The complete telecast hosted by Bob Hope. Bing is onscreen for five and a half minutes, joking with Bob and handing out music awards. Rosemary Clooney sings "The Man Who Got Away" and Dean Martin sings "Three Coins in a Fountain." This is the year Bing did NOT win an Oscar for "Country Girl" but Grace Kelly did. DVD-R: $15. (Broadcast Oct. 13, 1957) TV Special starring Bing Crosby, Frank Sinatra, Louis Armstrong, Rosemary Clooney, with special guests Bob Hope, Lindsey Crosby and the Four Preps. Louis Armstrong and his All Stars open the show with Bing doing "Now You Has Jazz." This is the show that introduced the Edsel to America and is complete with all commercials! Bonus: "Goldie, Fields and Glide" episode of The Jack Benny Show with Bing, Jack Benny, George Burns and Bob Hope. An hour CBS special hosted by Bing Crosby with guests Buddy Ebsen, Caterina Valente, Andre Previn and the Young Americans. Pepsodent ads with Jerry Colonna. Pontiac ad with Phil Harris. Bing opens the show singing "Wrap Your Troubles in Dreams" and later sings "Davy Crockett" with Buddy. Lots of songs, dancing and fun in this very rare show. With original commercials. Bonus: "Bing's Britain" (1976) Bing narrates a travelog of Great Britain. Bonus: 3 cartoons with Bing Crosby caricatures! (Broadcast Sep. 29, 1959) Special edition of "The Bing Crosby Show" stars Bing Crosby, Frank Sinatra, Louis Armstrong and Peggy Lee, with guest pianists Joe Bushkin, Paul Smith and George Shearing. Complete with Oldsmobile commercials by Florence Henderson and Bill Hayes. (Broadcast Oct. 19, 1959) Officially titled: "Bing Crosby and Dean Martin Present the Frank Sinatra Timex Special." Frank Sinatra is the true star of this hour TV special and sings many solos, plus four medleys with guests Bing Crosby, Dean Martin and Mitzi Gaynor. Surprise appearance by Jimmy Durante. Complete with Timex ads by John Cameron Swayze. 120 min. Both One-hour Specials on DVD-R: $25. "Bing's First Hour Christmas Special"
Bing's first one-hour Christmas Special for TV was broadcast on ABC on Dec. 11, 1961. Filmed on location, Bing wanders the streets of London encountering Terry Thomas, Marion Ryan, Dave King, Shirley Bassey and British street musicians, plus Bob Hope (in drag) who was in London to film "Road to Hong Kong." With original commercials. Broadcast on CBS on Feb. 15, 1964. We call it the "All-Star Show" to differentiate from other releases, though the official title is simply "Bing Crosby Show." "All-Star" is an understatement for all of these stars appear with Bing: Frank Sinatra, Dean Martin, Bob Hope, Rosemary Clooney, Kathryn Crosby and Peter Gennero. With original Pepsodent and Quaker State Oil commercials. Broadcast on ABC on Oct. 5, 1960 with Rosemary Clooney, Johnny Mercer, Carol Lawrence, Philip, Dennis and Lindsay Crosby and Nelson Riddle and his Orchestra. Bing sings medleys with everyone including "Please" and "Mississippi Mud" with his sons and a medley with himself! Broadcast on ABC on May 14, 1962 with guests Bob Hope, Edie Adams, Gary Crosby, the Smothers Brothers and the Pete Fountain Quartet with musical direction by David Rose.